With employment the key to the monetary policy outlook, plenty of focus will fall on one of the key leading indicators that was updated yesterday. For some time now, the RBA has clung to the outlook for employment to justify their outlook for overall monetary policy. Despite the economy looking rather weak on a number of fronts, it has been the strength in employment and the positive outlook which the RBA has continue to focus on. One of a number of key leading indicators has been turning south for a while now and the latest update saw a further fall. Since peaking almost 12 months ago, jobs ads have been in steady decline. After rising at an annual rat of 11.5% only a year ago they are now down 6% over the past 12 months. Historically the level of jobs ads has been a good leading indicator for the unemployment rate. However this relationship has broken down of late and. As jobs ads have declined over the past months, the unemployment rate has continued to fall. While the monthly jobs ads report has continued to slide, the RBA’s preferred leading indicator of employment has remains far more supportive of their outlook. 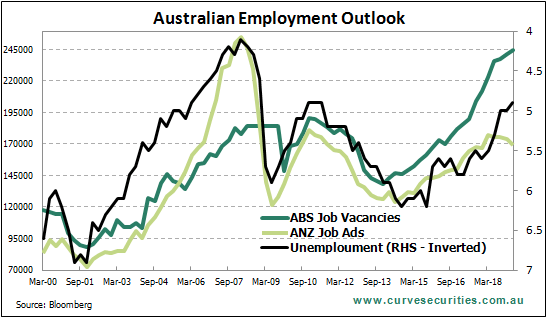 The job vacancies survey from the ABS continue to point to stronger demand for new employees than the job ads report suggests. In their report, the ANZ suspect that the divergence could be down to a structural shift in the way that businesses advertise for new positions. As job ads and job vacancies diverge, the other leading indicators give us little in the way of clarity in the outlook for employment. The employment index from the monthly business survey has stabilised after falling from last years highs and still points to reasonable jobs growth over the coming months. From the same report though, capacity utilisation continues to fall, suggesting we could see upwards pressure on the unemployment rate. How the outlook for employment resolves itself over the coming months will go a long way to determining the outlook for monetary policy.